Happy Friday! We want to share with you a great tool on Dakno Admin that will help your team increase their efficiency, respond to leads faster, and close more deals. Our support specialist Micah Jones explains it in our Feature Friday video below. Why Does Response Time Matter? Did you know that the average team takes 44 hours to respond to a lead on their site? That’s almost 2 full days! In the fast-paced world of digital marketing, you have to be, well, fast! The less time it takes to reach out to a lead, the more likely you are to convert that lead into a prospective new client. Well, How Do I Improve My Response Time? When it comes to improving your actual response time, you can’t go in blind! You need some kind of tool to track how you’re doing. After all, if you were trying to improve the amount of time it takes you to run a mile, you wouldn’t do it without a stopwatch, would you? Dakno’s Average Response Time Metric functions as that stopwatch for you and your team. The metric tracks your response time in two ways. It tracks both your individual response time as an agent, as well as your team’s overall response time average. The metric measures when a lead comes in, when that lead is assigned to an agent, and when that agent makes a public-facing reply. The individual agent’s response time is the amount of time between when that lead was assigned to an agent, and when that agent contacted the lead. 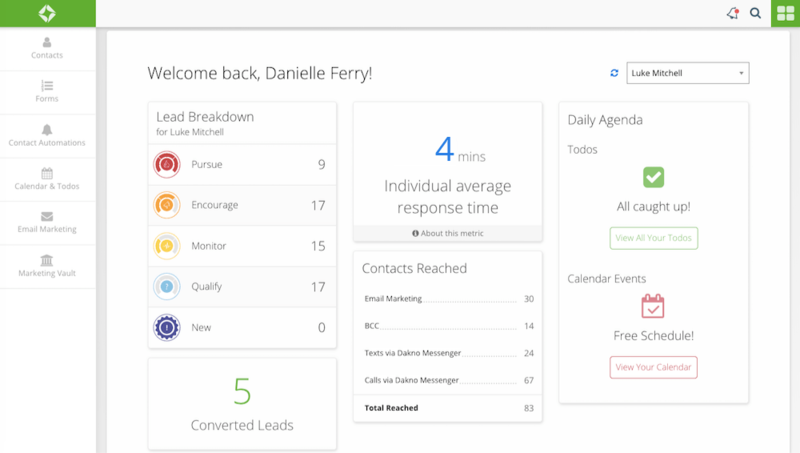 The Average Response Time Metric is just one of Dakno Admin’s many tools designed to increase your productivity and help you generate and convert new leads. Stay tuned for new Feature Fridays highlighting these tools, and how they can help you grow your real estate business!